Today's real-time digital oscilloscopes are so packed with bells and whistles (or "features," if you prefer) that you can forget how to use many of them. In fact, you might not even realize some exist! But they're all there for a reason, and they're all useful, maybe even more so than you know. To that end, we'll take a tour of a typical Teledyne LeCroy oscilloscope's features and give you some pointers as to how, and when, you can best take advantage of them. But even before we get into specifics about features, let's first step through some fine points on setting up your oscilloscope for an acquisition. Confirming that your setup is optimal will go a long way toward an acquisition that truly gives you insight into your DUT's functionality. One of the most basic parameters of an oscilloscope is bandwidth, and there are two kinds of bandwidth to consider. When we acquire a signal, the analog bandwidth at the oscilloscope's signal input has been defined at the -3-dB point, or the frequency at which a sine-wave input signal is attenuated to 70.7% of its true amplitude (also known as the "half-power" point). Following from that, when you're trying to make the most accurate measurement of amplitude that your instrument can make, be sure that the bandwidth of the oscilloscope is five times that of the signal of interest. 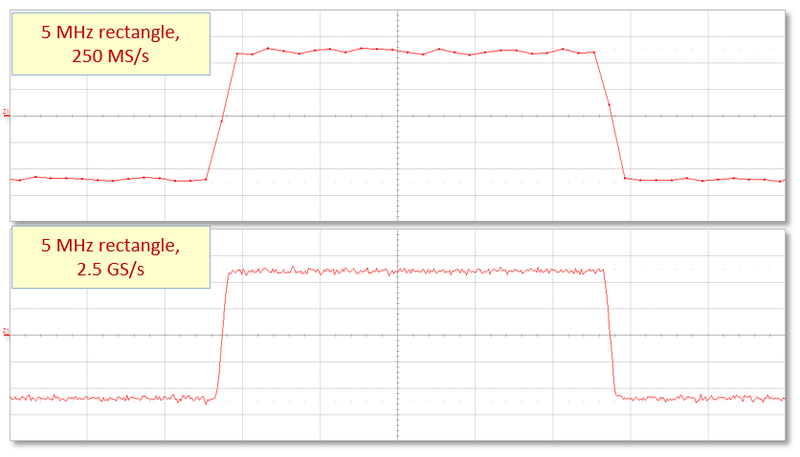 Also, consider that the system bandwidth of the oscilloscope includes the probes. Make sure your probes provide enough bandwidth for the task at hand as well. The oscilloscope's digital bandwidth defines the actual bandwidth you're going to see on the display. In setting your horizontal time base (in time/division based on the display grid), you are setting the capture window. But if you don't use the proper sample rate backed up with sufficient acquisition memory, your effective digital bandwidth will be less than you expect it to be. If you're looking at a sine wave, be sure your sampling rate is at least two samples/cycle (Nyquist rate). For signals with higher-frequency content, such as square waves, you'll want to use at least 4X to 10X oversampling. 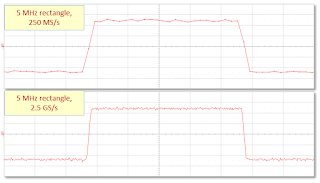 Figure 1 shows the difference between an acquisition made with an inadequate sampling rate (top) vs. one that captures a good amount of signal detail (bottom). 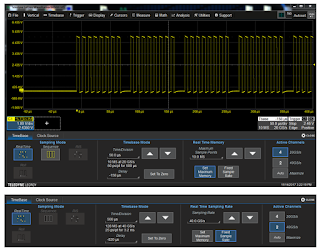 Now, if you're using a Teledyne LeCroy oscilloscope, did you know you can set it to prioritize either memory or sampling rate over the other? Touching the instrument's time base descriptor box on the display (Figure 2, center right of upper image) will open the time base dialog. By default, the time base will be set to Set Maximum Memory. You can change that by selecting Fixed Sample Rate. The default setting will lower the sample rate for longer time base settings, while the latter (Figure 2, bottom image) will keep the sample rate at whatever setting you choose, and then add or subtract acquisition memory as required to maintain a given effective digital bandwidth. are 8-bit (left) and 12-bit (right) examples. Vertical dynamic range is among the most important attributes of an oscilloscope. Some instruments have analog-to-digital converters (ADCs) in their front ends with resolutions of 8 bits, 10 bits, or 12 bits. The ADC process comes with quantization error, which is the difference between the continuous analog waveform that enters the converter and the stair-stepped digital representation that exits it. When a given sample point lands between two digital steps, the digital value of that point must be rounded either up or down, and this results in the quantization errors. Thus, it follows that more ADC resolution brings less quantization errors, because there are that many more quantization levels, more closely spaced, for voltage samples to be binned into. An oscilloscope with 12-bit ADCs has 16X more dynamic range than one with 8-bit ADCs (Figure 3). With 8 bits, you get 256 quantization levels per vertical division, while you get 4096 levels with 12 bits. That gives you a lot more detail and accuracy in your displayed waveform with a DC gain accuracy of about 0.5% vs. 1.5 or 2.0% with 8 bits. Next time, we'll discuss how to get the most out of your oscilloscope's navigation features and user interface.